No question about it: Every barbershop will treat your hair and beard perfectly. But now you could do it by your own at home: The Rumble59 beard oil mandarin helps. Not only the effect of this care product convinces - also the design of the flask with cool vintage labels. But take care: Right after usage pinups and rockabellas from everywhere will stick to your cheeks! Retro beard oil with a tempting fruity smell for the perfect beard care. Biff Bleackbeard is the roughneck who smiles dangerously from the label of the beard oil. He is an officially sworn member of the Schmiere gang. But how does that saying go? : Tough on the outside, soft at heart. Biff Blackbeard knows how it's supposed to be ... Take Biffs advice and pay heed to a perfect dappered beard at any time - even during a stiff breeze from north/northwest. The beard oil is made in Germany. It's notably pleasant and caring due to the natural basis of a mixture of almond and jojoba oil. Give your beard some shimmering but not flashiness shine. Certainly a beard shouldn't only be well-groomed but also smell well at any time. The Rumble59 beard oil has a fruity scent of mandarin which isn't flashy at all. Bottled in a nostalgic brown glas flask with 50 ml content as well as an useful pipette and with vintage labels the packaging looks great as well. This beard oil is for real men who make a point of a dapper appearance - just like Biff Blackbeard does! Take a look at the other beard care products by Schmiere too: The shaving soap for a wet shaving and the aftershave for a pleasant care after the shave. The application of the beard oil is as simple as it can be: With the help of the pipette take some drops of oil and dribble it on the palm of your hands. The amount of drops depends on the gorgeousness of beard which you call your own. Regarding the amount of oil: Less is more! : The beard only needs to be coated a little bit! If you've got a three-day beard 2-3 drops are enough. 4-5 drops are ok for a short to a medium long full beard. Spread the oil over your hands/ fingers and apply gently on your beard and skin. As soon as the oil is applied evenly the beard could be toned from the beard line to tip with your fingers or a beard comb. Immediately the essential and pleasant fragrance makes your day without being flashy. 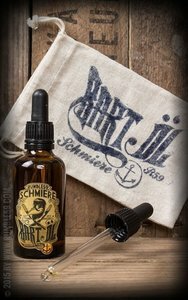 Schmiere by Rumble59 offers a great choice of hair products. Each one is beautifully designed, produced in Germany and cares for the perfect styling. The new Beard Oil - Mandarin bottled in a 50 ml flask is absolutely a must-have!